A monitoring system for your cashier payment transaction at your front desk. Real time video recording with the transaction data can be archive onto your server for future audit. 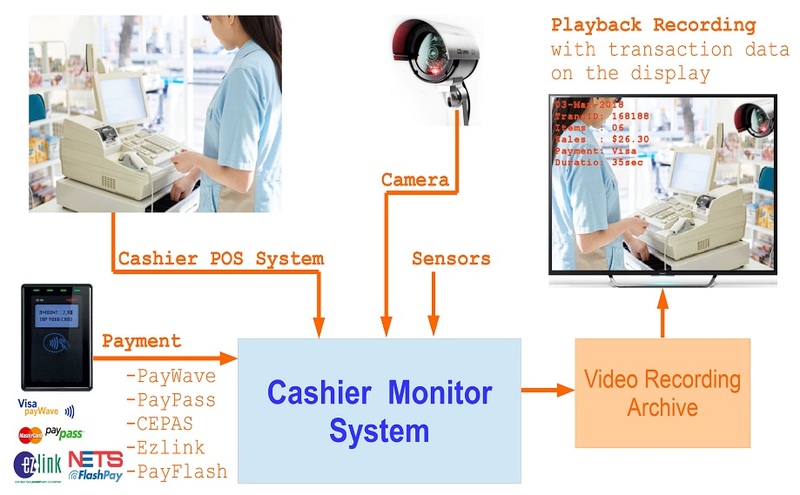 The cashier monitoring system is design to collect data from your cashier POS system (point-of-sales), payment terminal (contactless card, credit card), CCTV camera and other form of electronic sensor equipment. The collected data can be customised and display onto the video stream as an overlay. The video recording can then be archive onto your server for your keeping. This can help businesses to assess the payment process and cashier transaction to further improve business operation. Customised text information can be inserted onto the display to assist the monitoring of the video with the relevant information presented at the time of recording. The system consider of a on-screen display (OSD) engine which can render the information on the monitoring screen. 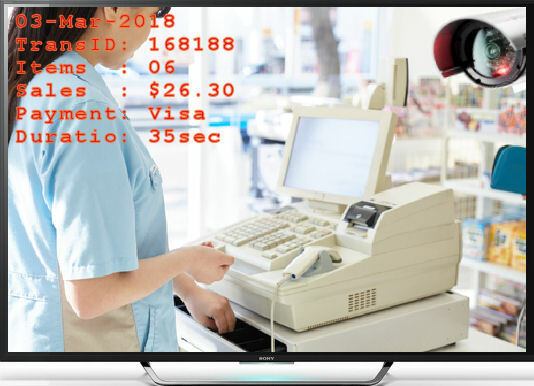 This cashier transaction monitoring system will collect transaction data from the POS cashier (point-of-sales) and payment terminal, displaying on the screen in real time. Depending on your application, customised sensor data can be collected and display real time onto your video recording. Cashier Monitoring with video recording of business transaction. Vehicle Car Number Identification video archive (license plate OCR). Customer queue number display on TV screen. Video recording with Sensor data monitoring information. Advertisement and announcement boardcast to a TV display. You can customise the text information overlay onto video. Contact Vitcomm Pte. Ltd. for further information.